Did you know that Rose of Sharon are a type of hibiscus? They look just like larger hibiscus flowers but have small blooms and grow as shrubs. Unlike the tropical hibiscus, Rose of Sharon are perennials in New England blooming in August through early September. They are a definite favorite with hummingbirds. 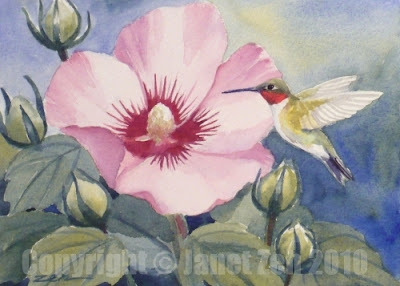 In this painting, a ruby-throated hummingbird stops by for a sip of nectar from a pink flower surrounded by five flower buds. The original of this painting is sold. Check my Etsy shop for currently available bird paintings and prints or let me know if you'd like a print of this one. Thanks for stopping by and have a lovely day!